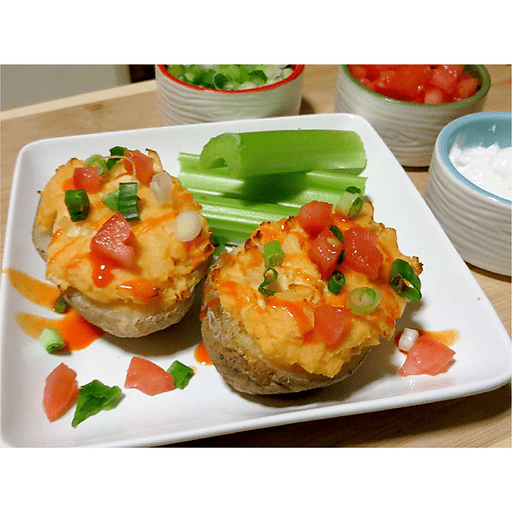 These Buffalo Chicken Twice Baked Potatoes have all the same savory flavor of boneless buffalo wings but with only a quarter of the calories! For a fun flair and to keep with tradition, use celery sticks to scoop up the fluffy insides of these twice baked potatoes. 1. Center oven rack and preheat oven to 425°F.. Place chicken in a sauté pan and add water until just covered. Simmer for 20 minutes and remove from pan. Let cool slightly. When chicken is cool enough to handle, shred using 2 forks and combine with 2 Tbsp. buffalo sauce. 1. While chicken is simmering, wash potatoes and slit each one lengthwise about 1-inch deep. Place potatoes in a microwave-safe dish and microwave on high, uncovered, for about 10 minutes. Let cool slightly. 1. Slice each potato in half length-wise, scoop out potato, leaving ¼-inch shell. Mash potato together with 3 Tbsp. buffalo sauce, milk, yogurt and margarine. Fold in shredded chicken. 1. Spoon mixture into potato skins, slightly denting center (to hold fresh toppings after baking). Place filled potato skins on a 9 x 13 baking sheet and bake about 15-20 minutes until tops are golden brown. 1. Top with green onions and tomatoes and serve with celery sticks. Calories 370, Total Fat 6g (Saturated 1.5g, Trans 0g), Cholesterol 75mg, Sodium 620mg, Total Carbohydrate 42g (Dietary Fiber 6g Sugars 5g), Protein 34g, Vitamin A 25%, Vitamin C 35%, Calcium 10%, Iron 20% *Nutritional values are an approximation. Actual nutritional values may vary due to preparation techniques, variations related to suppliers, regional and seasonal differences, or rounding.